But this book is so delightful! It’s Beginning to Look a Lot Like Zombies: A Book of Zombie Christmas Carols takes two dozen of our cherished Christmas Carols and turns them upside down, rewriting the lyrics from a Zombie point of view. Tiny tot’s eyes are no longer aglow, they’re in a bowl. Good King Wenceslas Tastes Great and we Deck The Halls With Parts Of Wally. 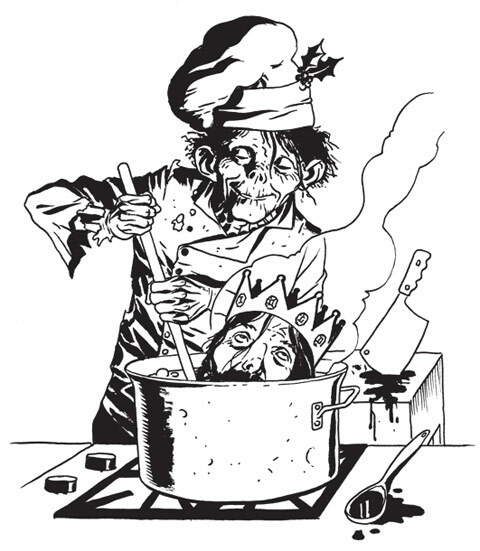 You’ll find all the soon to be classic Zombie Christmas Carol Classics, like I Saw Mama Chewing Santa Claus, Zombie, The Reindeer and many, many more. This is the perfect holiday gift for the Zombie fanatic on your Christmas list. With brilliantly gory illustrations by artist Jeff Weigel and an introduction by New York Times Best-Selling Author Christopher Moore, It’s Beginning to Look a Lot Like Zombies should be at the top of your Christmas Shopping List this fall. It’s not a question of if. The swine flu. SARS. The Spanish Influenza of 1918, these were all walks in the park compared to what awaits us. I’m talking of course about the Zombie virus. Right now, scientists are working around the clock in secret government laboratories working diligently to discover a vaccine for the dreaded bug. Personally, I don’t like their chances. (And also, did I mention that many of these secret government laboratories are located right in your own communities? After all, Zombie scientists still need to send their children to good schools). This is only going to cause the virus to spread faster when it breaks. Their efforts are futile. There is no escaping the Zombie virus. So when the world falls down around us. When we spend every waking (and sleeping) moment of our lives with machetes duct taped to our hands, let us not forget our most sacred holiday traditions. Just remember in the Zombie age, our holidays will be different. Canned goods will become like currency so don’t look for any cranberry sauce on your holiday table. In the post-Zombie Apocalypse a can of cranberry sauce will surely bring you at least two shotgun shells from the survivors in the compound across the river. Take the Yule Log. And use it to smash a Zombies head in. Or for warmth if you live in a northern climate. There won’t be any time for ceremonies like lighting the Yule Log when there are Zombies scratching at your door. You won’t be hanging stockings you’ll be wearing them for warmth. Yes even those tacky ones that you get at the mall with your name embroidered on them. But one tradition that doesn’t need to change is the Christmas Carol. It only needs to be altered slightly. And that’s why you’ve picked up this book. Just to hedge your bets. Because when you are turned (and you will be turned), you won’t want to be shunned by all the other Zombies when they are gathered round a steaming pile of brains. 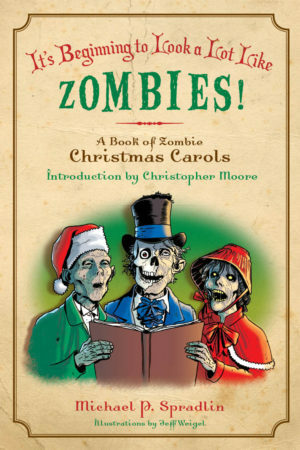 You’ll want to know the words to all the Zombie Christmas Carols to fit in with your new peeps. So pick up a copy. (Or better yet two or three since you’ll want everyone in your future Zombie family to be prepared). Good luck. Happy Holidays. And here’s hoping you won’t get turned. Even though you probably will. And here’s one last bit of advice. When the virus breaks out and everything around you is going south. Look at the Christmas Fruitcake in a new light. No one ever eats them and now you don’t even need to re-gift them. You can take a Zombie’s head off with one of those suckers. 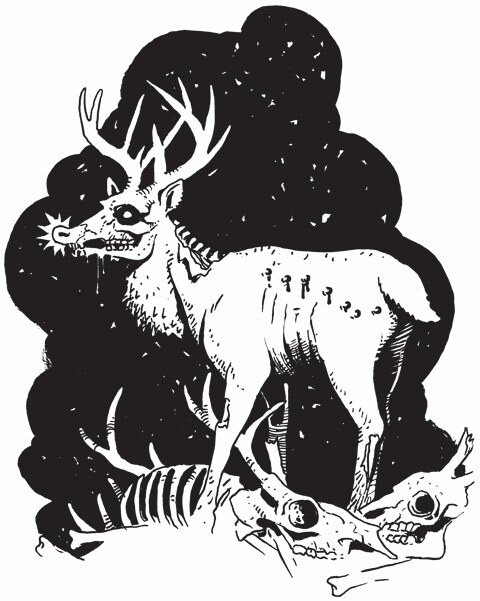 Learn more about the book, see more artwork and more at the zombie website. He made fine undead fuel. Hither, Zombies chase after her. For her brains they’re a jelling. Bring me flesh, and bring me brains. They even bite through leather. Through the poor souls’ wild lament. Caught the virus through his nose. You would even say he’s gross. Tried real hard to get away.